I have been on a quest for years to find the best brownie. May sound silly, but I bet every home baker has that same quest without even realizing it. In other words, you make a brownie recipe, decide, eh, could be better, and choose a different recipe next time. Sounds familiar, right? Why would you make the same recipe again if you don't think it's perfect? It's not like brownie recipes are hard to come by. And since I am a baker, my test kitchen is particularly frequently in use. I say all that to say, I've tried a LOT of brownie recipes in my lifetime. Similar to that all-American classic chocolate chip cookie, finding the perfect brownie is a momentous occasion. It's a very big deal. It means no more searching for recipes to test. It means bragging rights that you've discovered the best there is. And it also means a new standard for brownies you didn't know existed but now that you know, you'll be a far pickier eater moving forward. I am about to reveal to you what I believe is unequivocally, hands down the best brownie, bar none (pun intended! ha!). I suppose you could be grateful to me for all the time I'm saving you, but somehow, I don't think you'll be able to call this the best without first having tried a dozen so-so recipes. I challenge you to go through your cookbooks, make some of the brownies out of them, and then come back to this blog post and make this recipe. Your thank you will be a lot more sincere. It's worth pointing out, too, that this is a very subjective topic. I must have some chutzpah to call this the best brownie. Who do I think I am? Some people prefer their brownies fudgy, some chewy, some cakey, some dark chocolate, some not so dark, some rich, some less chocolaty, and of course there are those who fight over the edge pieces because they enjoy the crisp sides with the softer center. So to clarify my calling this the Best Brownie on Earth, that is a true statement for me and probably others who like rich, dark, chocolaty, fudgy brownies. But I admit, making such a bold claim puts it all on the line for me. You might try out this recipe, completely disagree with my superlative of a title, hate the brownie, never trust my judgment again, and never return to Happy Go Marni. I hope that's not the case, in fact, I'm confident after one bite you'll love me forever, but I'm willing to take that risk. Yes, this is the recipe on which I've decided to gamble away my credibility. You'll notice that the recipe calls for a ton of chocolate...and by a ton, I mean a pound. That's right, a whole pound for one 9x13-inch pan. Don't skimp and think you can skip a few ounces. And please don't waste your time on cheap grocery store brands. The chocolate you choose for the recipe ends up defining the brownie. Last time I made these, I spent about $15 on Valrhona chocolate. Only the best for dear old Dad! Whenever I visit my parents in the Bay Area, I try to whip up a batch to give them. Living near SF, they can have the bakery's version whenever they want, but it's not every day they get the cookbook version specially delivered from L.A. So without further ado, here's the recipe to this earth-shattering, life-changing brownie. I hope you love it as much as I do. Updated: I really must give credit where credit is due. 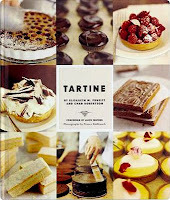 A huge shout out and thank you to my Uncle Gary and Aunt Francie who gave me the Tartine cookbook as a birthday present a few years ago. Muah! You two have made my life a whole lot sweeter! Preheat the oven to 350 degrees F. Butter a 9x13-inch glass baking dish. In a small saucepan, melt the butter over low heat. Remove from the heat and add the chocolate. If the heat from the butter does not fully melt the chocolate, put the pan back over the heat for 10 seconds and stir until melted. Set aside to cool. Sift the flour into a small mixing bowl. Set aside. In a medium mixing bowl, combine the eggs, sugar, salt, and vanilla. Using a mixer fitted with the whisk attachment, beat on high speed until the mixture thickens and becomes pale in color and falls from the beater in a wide ribbon that folds back on itself and slowly dissolves on the surface, 4 to 5 minutes. Alternatively, use a mixing bowl and a whisk to beat the ingredients until the mixture falls from the whisk in a wide ribbon. Using a rubber spatula, fold the cooled chocolate into the egg mixture. Add the flour and fold it in quickly but gently with the rubber spatula so that you don't deflate the air that's been incorporated into the eggs. Pour the batter into the prepared dish and smooth the top with the spatula. If you are using nuts, evenly distribute them across the batter. Bake until the top looks slightly cracked and feels soft to the touch, about 25 minutes. Let cool completely on a wire rack. Using a sharp knife, cut into 12 squares, or size desired. The brownies will keep in an airtight container in a cool place for up to 1 week. Kitchen Notes: You can't use a cake tester to judge doneness for these brownies. Becaues the batter has a high percentage of chocolate, the tester comes out wet even if the brownies are done. Batter is ready for the oven! Best brownie on Planet Earth! this is AWESOME. not the brownies but... comment by Mom. Delicious Coma was just telling us how her future MIL also comments on her blog but.. this is AWESOME! and Tartine's brownie was about the ONLY thing I didn't order last time there. Next time, brownies over the popovers fo sho! Mom - Next time I'm up, wanna have a pound of Callebaut or El Rey ready to go? Consider it a worthwhile expenditure. I'll bake you some brownies! SinoSoul - So funny. I know, my mom is probably my number one fan and most regular reader. I love it! And I'm shocked you haven't already ordered the brownie at Tartine, though I can't actually vouch for it since what I've fallen in love with is their cookbook version. You'll have to report back! Marni, these brownies look amazing! I'm not a baker, but I am obsessed with brownies, and I also like chocolaty, fudgy brownies. BUT I don't like nuts in mine -- I'm a chocolate purist LOL. Anyway, the chocolate part of these brownies look to die for! That recipe looks dynamite! Very simple ingredients, and extremely chocolate-centric! But are you saying that these brownies are even better than Linda Mayman's?! oh, these look so delicious! i prefer brownies without nuts, but i'd eat these for sure. We deserve some credit. We gave you the cook book. shopeatsleep - You will have to make these brownies (sans nuts) and let me know what you think! Uncle Gary - You are absolutely right, and so I've gone back into the post and updated it with a little shout out to you and Aunt Francie! Thanks so much for the cookbook. It's changed my life! I forgot to mention that I've had the brownies from Tartine's. The last one cost me $68.50 - $3.50 for the brownie and $65 for the ticket for double parking. Was it worth it? That's me -- the one who loves the crispy edges. And your pics have me salivating because I also am addicted to the top crackly part of a brownie. Have never baked the Tartine version, but now you have convinced me to! These were spectacular! Definitely going to be a staple for me now. I made the mistake (?) of warming them a little before serving a la mode (not thinking about the high chocolate content) and they turned into a kind of rich chocolate pudding. The audience was split on whether they were better hot or cold!